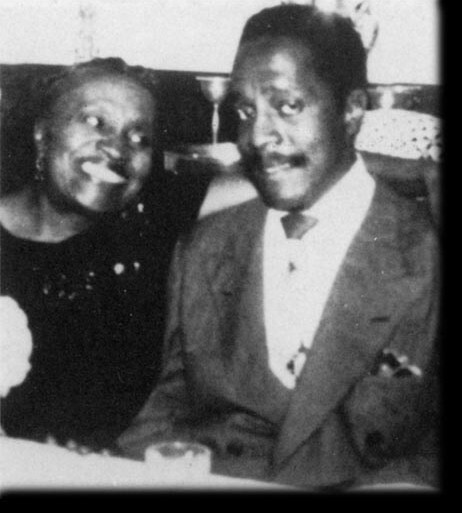 Bud with his mother, Pearl Powell. Bud (left) with Charles Mingus (center) and Kenny Clarke (on drums, in distance) at a recording session in New York City, 1946. In the foreground, sketching, is the French musician and author Charles Delaunay, who was co-founder of the Hot Club de France. 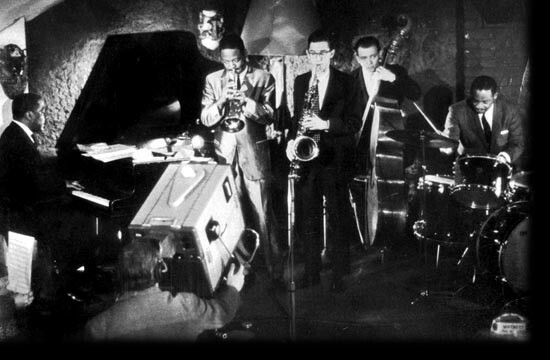 Bud (left) performing for French television at Club St. Germain, Paris, 1959 with Clark Terry (flugelhorn), Barney Wilen (tenor sax), Pierre Michelot (bass) and Kenny Clarke (drums). 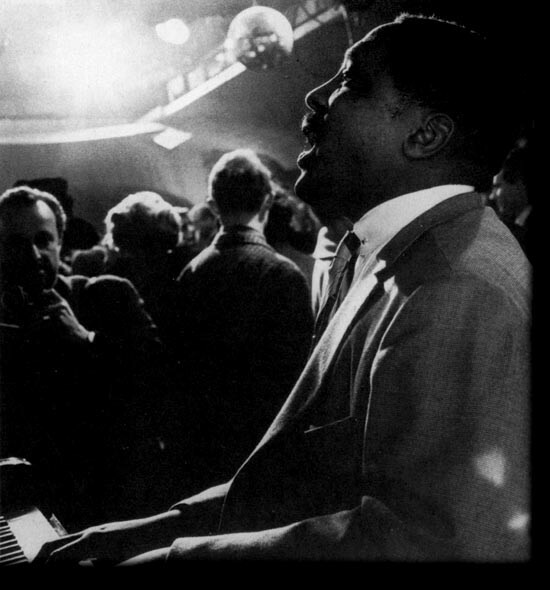 Bud performing at Birdland, 1964. Born in 1924, Bud's earliest musical experiences occurred when jazz was emerging as a major force in music. Louis Armstrong was making his landmark recordings, Jelly Roll Morton was breaking new ground on the piano, and the great stride pianists like Fats Waller and James P. Johnson inspired the young Art Tatum to a level of virtuosity unprecedented in the world of piano jazz. Bud's own father was a stride pianist and band leader so Bud was steeped in the new music of jazz from the beginning. Before Bud was ten he had absorbed everything he had heard by the great stride pianists and was already playing with jazz musicians. They would "steal" the young boy away and keep him up late at night. They were amazed at the young prodigy. His father insisted that he continue his classical piano studies, but by the time Bud was a teenager the lure of the jazz world was overwhelming. 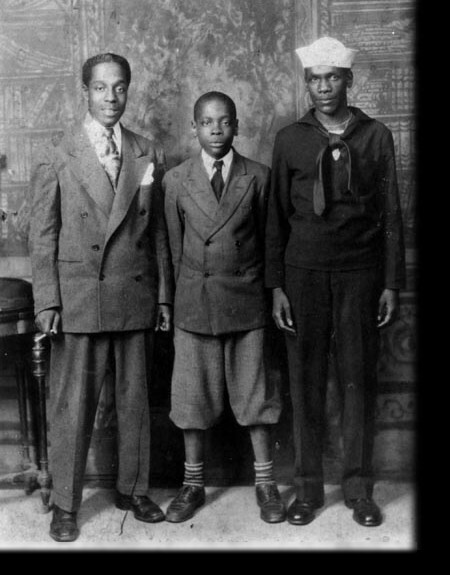 By 1939 he was playing professionally in a band led by his older brother Bill. Art Tatum and the pianist Billy Kyle were major influences, and he would also have been very much aware of the other great swing era pianists like Teddy Wilson and Nat King Cole. In the early 1940s Bud did his apprenticeship with several bands as well as doing solo gigs in night clubs in New York. He hung out at places like Minton's Playhouse, famous as an incubator of bebop, and became a close friend of Thelonious Monk, who took the younger Bud under his wing. 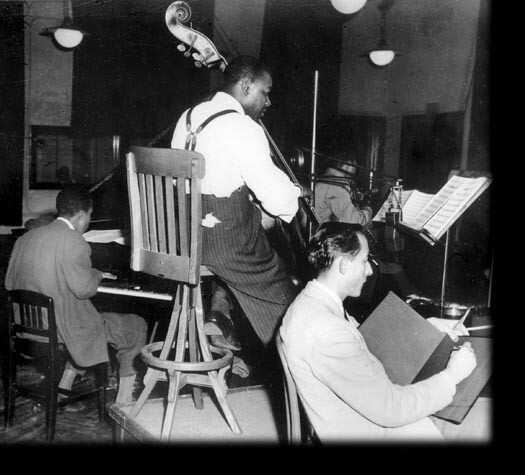 Bud joined Cootie Williams' band and it was with Williams that he made his first recordings in 1944. Throughout the rest of the 1940s Bud's talent and creativity exploded on the jazz scene as he played and recorded with virtually every major figure in the emerging bebop style as well as accompanying Sarah Vaughan on more commercially oriented releases. By the end of the 1940s Bud Powell was the dominant jazz pianist whose genius is well documented on many recordings. In and out of mental hospitals, Bud's performing and recording career was erratic but remained at white heat until sometime in 1953, when the ravages of alcoholism, an earlier beating administered by police, and electric shock treatments began to take a toll on his brilliant piano technique. Many critics feel that Bud's playing from 1954 until the end of his recording career in 1964 was unworthy of the high standard he had set in the earlier years. But others find great depth and beauty in both Bud's playing and in his compositions from the post-1953 period, even if the fiery technique was diminished. In 1959 Bud left New York for Paris where other American jazz artists had found a comfortable environment to pursue their musical careers. In Paris Bud was befriended by a young jazz fan named Francis Paudras, whose important, if somewhat romanticized, role in Bud's life is described in his book Dance of the Infidels, now available in English translation. Francis' role in Bud's life was also the inspiration for the 1986 movie Round Midnight, in which Dexter Gordon played the role of a jazz musician befriended and supported by a young fan. During the Paris years Bud experienced a partial renaissance and made a number of very fine recordings, some of which are included in the Music Samples. In 1964 Bud made a triumphant return to Birdland but his success was short-lived as he quickly descended back into alcoholism. In 1966 he died in obsurity and neglect at the age of 41. His family refused to claim the body but his friend Max Roach took the necessary legal steps to arrange for a New Orleans style funeral procession in which Bud's coffin was accompanied by a Jazzmobile on which Barry Harris and Lee Morgan played Bud's compositions. There were an estimated 5000 people along the Harlem streets paying tribute to the tragic life of one of the greatest figures in the history of jazz.